Autism is the fastest growing developmental disability (CDC, 2008).90% of those with autism suffer from Sensory Processing Disorders (Scott D. Tomchek, 2007), which effects negatively on their social interaction, causing stresses to both patients and their care givers. With the growing number of people falling within the autistic spectrum, architecture has a responsibility, not only to create building design guidelines and built environment that promote, empower, and sustain health and wellbeing, but also to look beyond the built environment to a more intimate human body architecture scale, this will be supported by the advancement of material computation and fabrication methods. 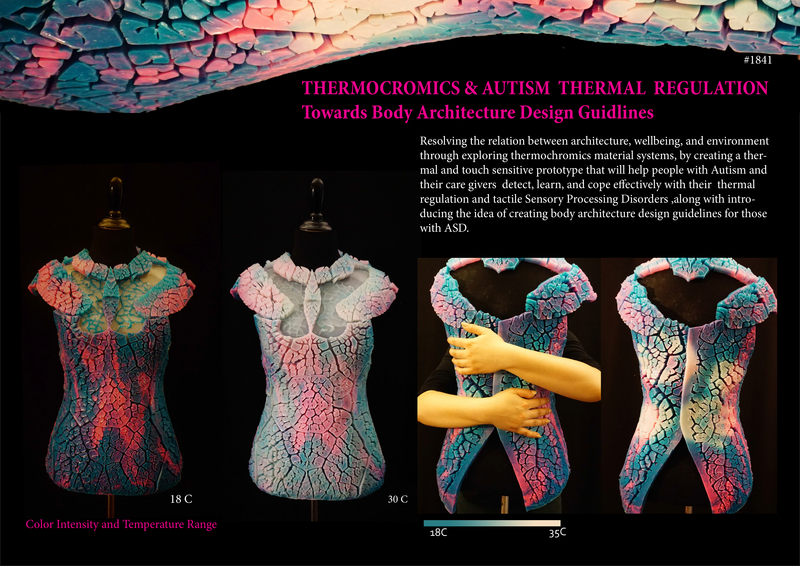 This research introduces the notion of creating body architecture design guidelines, to resolve the relation between architecture, wellbeing, and environment, focusing on ASD’s thermal regulation and tactile sensitivity, through exploring thermochromics material systems, to create a thermal and touch sensitive prototype, to help people with ASD and their care givers, detect, learn and cope effectively with their Sensory Processing Disorders. The framework includes fabricating functional material organizations while varying properties to correspond to various functional constraints and rethink the design not as form-driven, but as a behavioral driven paradigm (Oxman, 2012). 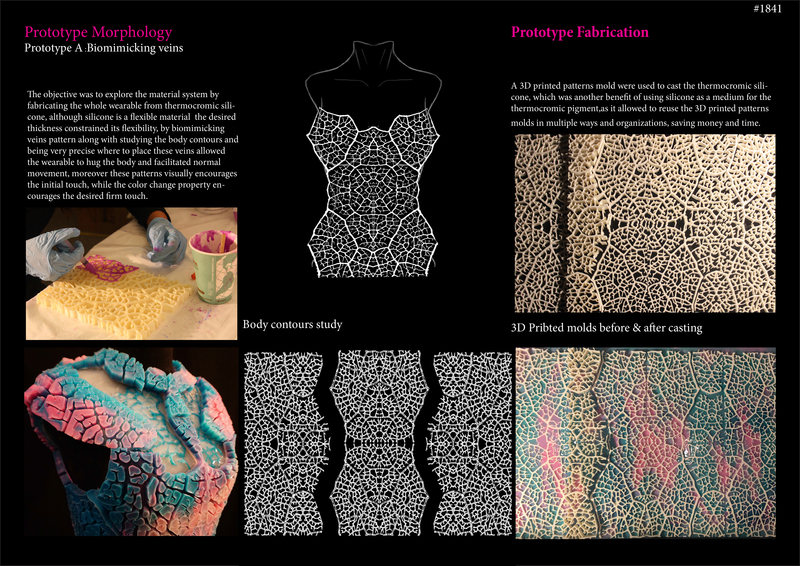 To facilitate this approach, a four-phase process was conducted to choose the material, form, and fabrication method. The first phase included a series of material experiments to choose the wearable thermochromic system that would best visually indicate temperature change and register firm touch, The second phase was prototype morphology to design a wearable prototype that hugs the ASD ’s body and adds a weight pressure, while encouraging firm touch to regulate the ASD’s sensory intake and work as a visual temperature indicator with its thermochroic reactive property.The thirs phase is the prototype fabrication using 3D printed molds to cast the thermocromic silicone. The final phase is the three Rs: register-react-report, were the prototype wearable registers the pressure assigned through firm touch by imbedding FSR sensors connected to the IOT (internet of things), so the data can then be collected wirelessly for further studies, and a heart rate monitor that registers the heart rate through a mobile app. The second step is reacting, the reaction is visually by changing color responding to temperature change or pressure applied, and auditory through the heart monitor alarm when the heart rate exceeds the normal range. The last step is to report to a mobile app to study the coloration between applied pressure and anxiety. The results of this research are two prototype wearables that can register touch and temperature change by reacting visually, through color change property of thermochromics material system, physically through imbedded pressure sensors, and auditory through an alarm when the heart rate monitor indicates abnormal heart. This research was conducted at University of Michigan, as a Master of Science in Architecture Design and Research capstone. The cost of prototype A was 1200 $, which includes the 3D printer machine time, thermochromic pigments, silicone and sensors, as for prototype B; the cost was 120$. This wearable is expected to work as a visual learning tool that can help people with ASD understand and cope independently with the environment. The next phase of this research will be a prototype testing on people within the autism spectrum in collaboration with occupational therapists and physiologists, to develop the design much further, implant sensors within the casted silicone, and add more anxiety indicators. This research presented novel ways in helping the human body communicate, and learn from its surrounding environment, where material systems react in real time and responsive manner, creating new ways of communication between architecture and its inhabitants.